By now everyone knows what this coin is, struck at the Philadelphia Mint in 2015 and secretly released into circulation without fanfare. The few boxes that remained unopened became an historic numismatic event, the lowest mintage Mint State Silver Eagles in History! Mint verified that they struck 79,640 coins at the Philadelphia Mint in 2015. Were you ever sorry that a great opportunity had passed you by? This is your chance to own what may well be the coin of great opportunity for you. 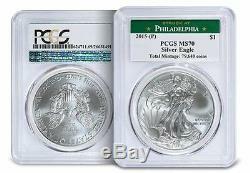 The perfect coin graded by PCGS in perfect MS 70 condition! Note: Stock photo used; See Item Specifics for Certification Number of coin currently up for sale. 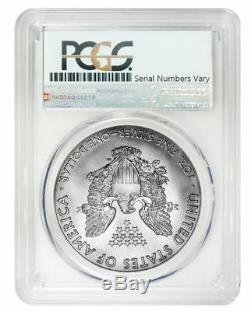 UPDATE: At the present time, out of the 79,640 coins minted, PCGS has graded only 150 of these 2015 P American Silver Eagles in this configuration; Perfect MS 70 condition, and this is one of those coins! Don't let this one pass you by... 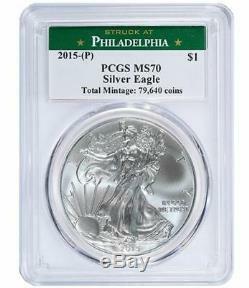 The item "2015 (P) American Silver Eagle PCGS MS-70 THE RAREST MINT STATE EAGLE EVER" is in sale since Monday, March 25, 2019. This item is in the category "Coins & Paper Money\Bullion\Silver\Coins".